Basement Systems not only has solutions to keep water out of your basement or crawl space; we also address moisture problems that can make your home uncomfortable and worsen allergies and asthma. When there's too much moisture in your home's air, you can see, feel and smell it. In areas such as the basement and crawl space, where there’s greater dampness, installing a dehumidifier will help. 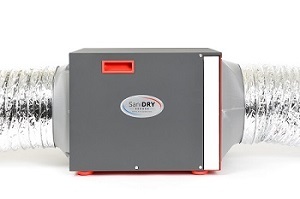 The SaniDry™ Sedona is the world's most efficient dehumidifier without a heat exchange core. The SaniDry™ XP is a self-draining dehumidifier. It removes up to 10x the moisture of a standard unit. 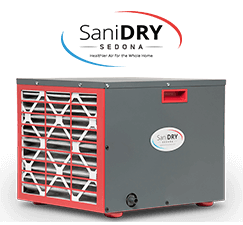 The SaniDry Sedona can be ducted, so it doesn't have to be located in the space you are drying. No bucket to empty - designed for continuous operation. A dehumidifier helps maintain an ideal relative humidity (RH) level in your home. When inside air enters the dehumidifier, a fan forces the air over cold coils to remove moisture and drier air is blown into the basement or crawl space. Stop mold and mildew. Mold and mildew can grow when relative humidity levels go above 50%. By drying out basement and crawl space areas with a dehumidifier, you can create a drier environment that’s “hostile” to mold and mildew. Eliminate musty odors. Getting rid of mold and mildew will do away with the bad smells that come into your living space from your basement. Protect family health. Mold reproduces by putting microscopic spores into the air. These airborne organisms trigger allergic reactions and respiratory ailments in many individuals. Effective dehumidifying in basement and crawl space areas can put an end to this serious form of indoor air pollution. Bring the basement up to “above-grade” standards. If your basement is finished or you're planning on finishing part of your basement to expand your home’s living space, you’ll want this new living area to be just as comfortable as any room upstairs. Effective dehumidification is the answer. Click below to get answers to these commonly-asked questions about dehumidifiers. My basement has a waterproofing system and it stays dry. Do I still need a dehumidifier? Many “dry” basements still need dehumidification because concrete is a porous material; it will absorb moisture from the soil and release that moisture to the interior of a basement or crawl space. If the soil around your house tends to be wet, the amount of moisture that diffuses into the basement may cause excessive humidity. When relative humidity in a basement or crawl space climbs above 60%, mold is likely to take hold. Why can’t I use a standard dehumidifier to control humidity in a basement or crawl space? You can use a low-cost dehumidifier, but it’s certain to cause problems. For starters, it will have much longer run times than a Basement Systems SaniDry™ dehumidifier, because of its undersized cooling coils. Energy consumption will be high, dehumidification capacity will be low, which means premature burnout is likely. Inexpensive consumer-grade dehumidifiers are designed to function at higher “upstairs” temperatures, not in the lower temperature range found in basements and crawl spaces. 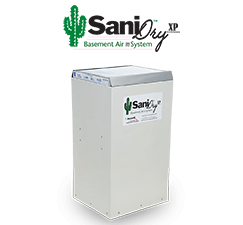 Another feature that makes SaniDry™ dehumidifiers better for basements is the dual air filter that traps mold spores, dust mite debris and other particulate pollutants. What are the maintenance requirements for a basement dehumidifier? Look for key features that make the dehumidifier easy to operate and maintain. For example, SaniDry™ dehumidifiers have easy-to-use digital controls. You set the target humidity level, and the SaniDry™ will operate automatically to maintain that level. You never have to empty a water reservoir with the SaniDry™ because it can drain into a sump pump or utilize a condensate pump for automatic drainage. SaniDry dehumidifiers are installed exclusively by Basement Systems dealers. Contact us today to schedule a consultation and cost estimate with the contractor in your area!